It was definitely not what she expected to discover that night. For when Angie finally managed to get her 21-month old down for the night—a clear victory in their house—she finished tidying up the kitchen and was thinking she might even go to bed early herself. Until, that is, she heard the knock at the door. With her husband out for the evening, and having just moved to the community a few weeks earlier—to say nothing of expecting their second child in just a matter of weeks–Angie was understandably hesitant to open the door. But the knocking kept on, persistently so for over half an hour, in fact. Until suddenly there was another sound and looking down the stairway from where she sat upstairs—cell phone in hand to call for help if needed—she saw a note pushed under the door. Angie had no idea who Beverly was, but quickly figured out that she must have been a neighbor who had mistaken her family for the one who lived in the university-provided house before them. So she rang Beverly up on the phone number she had listed to let her know what had happened. Only whether it was her Texas accent falling on decidedly English ears or not, Beverly didn’t seem to understand at all that Angie wasn’t the same person who had baked the cake for her son. Still, Angie and her husband Steve, along with their 21-month old, Jed, spent most of one day that week shopping for a Transformers action figure and cake decorating supplies and ingredients, and then baking a four-layer cake, making the icing and decorating it—a project that turned into a 15-hour operation, in fact, stretching late into the night. And when they took the cake to Beverly on the following day, she then found out that the woman who had lived in their home before them had actually been a part of a network called “Free Cakes for Kids” in which amateur bakers make cakes for kids in need. What’s more, Beverly and her husband could not have been nicer, and even invited Angie and Steve to the birthday party on Saturday if they could come. Angie’s “take on the cake” is worth repeating, however, for she summed up well what it means to follow the Spirit’s promptings when they may come in our lives. “As I was making this cake, I felt like God was in the midst of it, trying to teach me to live more in him. One thing I kept feeling was surrender— I hadn’t planned or volunteered to make this cake and I had little skill to do it, but it somehow just fell into my lap, and it seemed that God had put it before me. Jesus says that he stands at the door and knocks! And in my experience he keeps on knocking! And it reminded me that our lives are meant to be about opening up to God and surrendering to his purposes for us, purposes that we don’t always see coming, things he wants to do in and through us. I get so obsessed with trying to plan out my life and organize and schedule everything, but in this cake the Lord reminded me that my life is really to be about getting caught up in the life that he would rather have me live. Something else God showed me was his heart for us, a heart of immense and reckless love. One of Jed’s favorite stories is the parable of the lost sheep, where the shepherd is relentless in his search to find the one missing sheep out of a hundred. It’s a foolish thing the shepherd does, to spend all that time and effort on one little sheep. Jesus asks, “Which one of you wouldn’t leave the ninety-nine sheep out on the field and go after the one missing sheep?” I think it’s a rhetorical question— that’s crazy, none of us would do that. 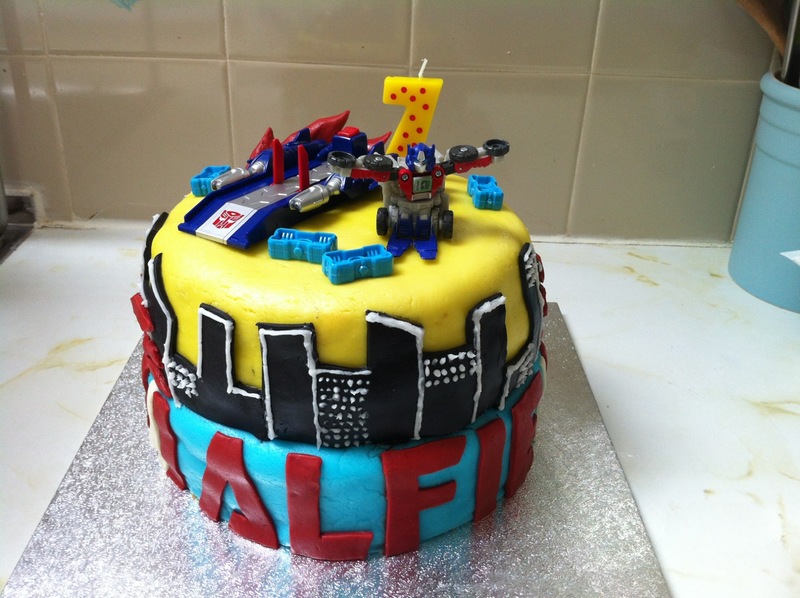 Which of us busy moms wouldn’t drop everything and spend 15 hours baking a Transformers birthday cake for a kid you’ve never met? Were it not for the grace of God, I wouldn’t. But this is the kind of God we have, one who loves us recklessly and personally, and goes to great effort to seek us. This is what God does. He reminded me of that in the hours I spent making a cake for a little kid on a rough council estate across town, a kid I’ll probably never meet. The life and kind of love God calls us towards is one a reckless love, one of abandon, of giving up ourselves and our plans for others. It all reminds me of what St. Paul said long ago, namely, that we are God’s handiwork, “created in Christ Jesus to do good works, which He prepared in advance for us to do.” (Ephesians 2.10). I can’t help but wonder, in fact, just how great it might be if we were all transformed into folks with hearts ready to serve others, even when it takes us out of comfort zones. Yes, I’m late on reading all these – GREAT – and LOVE the cake – Angie did a fantastic job!!! !